Answerland’s Quality Team is a volunteer group of Answerlanders from around the United States. They help improve the Answerland experience by managing the mentoring program, providing best practices and tips for a quality reference experience, and recognizing quality digital reference work. Answerland’s Quality Team mentors as well as recognizes librarians for high quality digital reference work while staffing the service. Everyone is welcome to nominate transcripts that exemplify high quality virtual reference service for the Notable Transcript Award; please send nominations to any member of the Quality Team. Additionally, Answerland librarians can log in and view transcripts that have received the Notable Transcript Award as well as thoughts from the Quality Team on what made them notable. In evaluating transcripts, the Answerland Quality Team uses the following rubrics as a guideline. 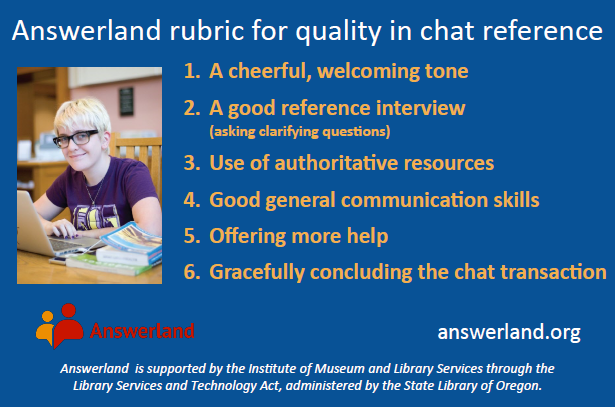 Download the chat rubric reference card as a handy reminder. A short answer, ideally no more than 160 characters. Longer answers that require a reference interview are also acceptable. In addition to an answer, the librarian’s message may include a brief web address to cite the source of the answer or to provide additional information. Sign with a first name in order to make a human connection with the patron. The Answerland Quality Team welcomes your nominations, feedback, and suggestions.